petscure - How To Bathe Your Dog? To bathe the dog is part of basics hygiene and grooming. The bathroom is not only essential to keep your dog clean, but also essential to maintain balanced fur, being a basic step towards good health. 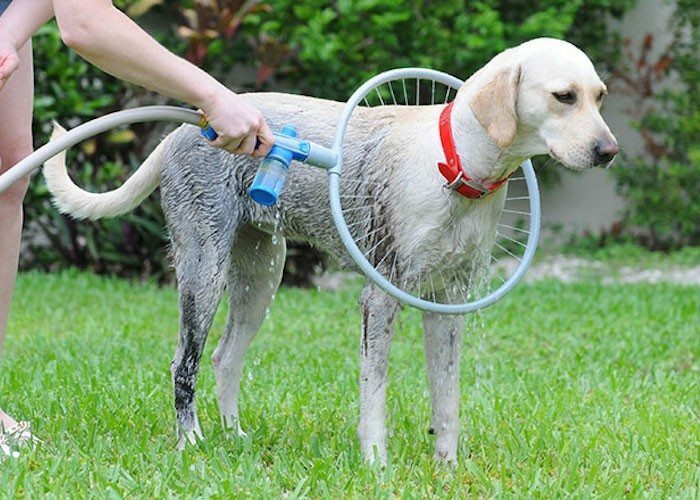 When bathing your dog, it is very important to get products for dogs only, no product for humans. A shampoo for humans could dry out and cause itching and discomfort. If you do not know what brand to buy, your vet or groomer could recommend several. You will need the following items. The pH of a dog is different from a person, so it is imperative that you use one for dog’s skin. It is optional for dogs. If you have a dog with long hair, a comb is essential, while this is not as necessary if you have a dog with very short hair, brushing will suffice. You can do with any old but clean towel you have at home. It must be large enough to cover the dog completely. Get a hairdryer if you have a long haired dog or with great hair. This is very important especially in winter. Comb your dog before bathing, especially if the dog has long hair before rinsing. This will prevent knots that could not only be difficult to remove, but also painful for your dog. Fill the tub with an inch or two of warm water. Lather the dog. It is not necessary to use an excessive amount. Rinse the shampoo and get all the shampoo out; any residue can cause irritation. Use a conditioner. As with people, the condition softens the hair, prevents knots and moisturizes the hair making hair more manageable. If you choose a conditioner, rinse it completely. Dry your dog as much as possible from the root to tip. Do it gently without rubbing. The best way to do this is to cover the dog with a towel. Use a hair dryer at the lowest heat if it is winter or you have a long haired dog. It is possible that before using the dryer for the first time, you may get your pet dog familiar with the sound. It is imperative that you caress your dog while you bathe and say encouraging words, as many dogs do not like bathing. It is counterproductive to punishment. It is better to learn how to teach the dog to have positive association and love to bathe. You must know how often should you bathe your dog. After each bath, you should always do something fun with your dog such as feeding, take him for a walk or play together. In this way, your dog not only tolerates the bathroom, but he knows that something wonderful will be followed.